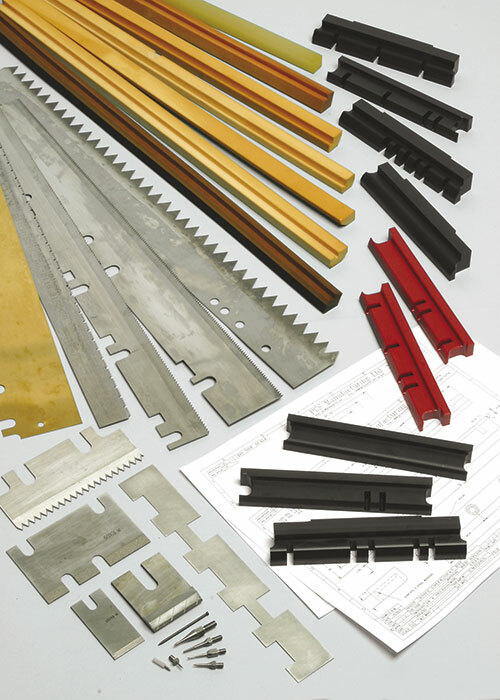 The wide range of Web Offset folder parts are manufactured in Europe from high quality materials to increase performance. For use on the Web Offset cutting and folding units to hold the cut-off blade in place. Both Plastic Knife Cheeks and Pressure Bars are available for the most common Web Offset presses. Knife Cheeks are manufactured in two materials:Red –Nylube – synthetic additive for long life. Black – Cast Nylon – durable, rigid material. Knife Pressure Bars are made from hard and soft cellular polyurethane foam with a profile engineered in the shape required by the press. Knife cheeks are precision engineered to exact customer specifications using the latest AutoCad drawing technology. Standard profiles can be m odified by engineering to suit customer requirements. Most popular OEM Pins available from stock. Available with straight, tapered, stepped or serrated needles.